At WhiteSands Treatment Center, we strive for objective, measurable and quantifiable criteria to guide in the determination of a patient’s care and treatment. We believe that quality care in the assessment and treatment of substance-related disorders is comprised of not only objectively measured criteria, but also based on experimentally- based professional judgments. Referral to a specific level of care is based on a careful, individualized assessment of each patient with an alcohol or other drug-related problem. The intent is to place the patient at the most appropriate level of care that is the least intensive, but meets the treatment objectives, while providing safety and security for the patient along a continuum. This means that a patient can begin at a more intensive level and move to a more or less intensive level of care depending on his or her individual needs. The continuum of care is delivered across all treatment services that reflect the varying severity of illnesses and the intensity of services required. Each patient receives a psychiatric evaluation upon admission to WhiteSands Treatment Center and, when deemed appropriate, the patient is seen for follow-up evaluation and treatment by a psychiatrist and members of his or her staff while the patient is in the Detoxification and Inpatient Rehabilitation Program. All treatment services share common and key elements in providing comprehensive, individualized care for co-occurring disorders. These include having M.D., PhD and Nursing level staff skilled in the diagnosis of psychopathology. All staff members are cross-trained to deal with addictions and substance-related disorders. All psycho-educational services of treatment address key aspects of co-occurring disorders. A psychiatrist is available on site for all levels of care. Medication management is integrated into the treatment plan as indicated, with counselors trained to monitor and promote compliance with the individual plan of pharmacotherapy. Intensive case management occurs at all levels of care. Individual evidence-based psycho-social therapies are provided by a Primary Therapist to each of our patients. Psycho-social treatments for substance addiction basically aim to alter the patient’s attitude and behaviors regarding the use of drugs and alcohol. These therapies enhance coping skills when facing life’s challenges, navigating high risk situations, avoiding substance abuse triggers, controlling cravings and coping with relapses. Some therapies focus on enhancing our patients’ motivations to change their substance-related behaviors. Other therapies focus on helping our patients alter their environments in order to reduce pressure and temptation to use. Psycho-social therapies are a critical component of almost every treatment regime at WhiteSands Treatment Center, regardless of the primary substance of addiction. When combined with pharmaceutical treatments, they enhance treatment effectiveness. Evidence-based interventions selected at WhiteSands Treatment Center are those clinical practices that have been proven to consistently produce specific-intended results as reported in the scientific literature. They range from Motivational Interviewing (MI) and Motivational Enhancement Therapy (MET) to Cognitive Behavioral Therapy (CBT), and structured couple and family therapy as solution-focus therapy. In addition to a variety of styles that are utilized in the treatment of people with chemical dependency, a behavioral approach is used to address patients’ participation in the program by the development of a master treatment plan, which consists of behavioral components for the patient to participate in, and allows the staff to observe and evaluate a patient’s progress in their own recovery. Group therapy meets once a day for one and a half hours. It is conducted by a Primary Therapist who is responsible for facilitating the group. Group therapy is an important component to the recovery of the chemically dependent. It provides patients an opportunity to identify with others and recognize problems related to chemical dependency. It allows them to participate in an environment where they can speak more openly, honestly, and expressively about their feelings, while gaining support from peers, and receive support and feedback. Addiction is a family illness, impacting not only the person suffering from the disease, but also their significant others as well. Family members often have medical problems (i.e. hypertension, ulcers, and other stress-related illnesses) as a result of living with an addicted person. 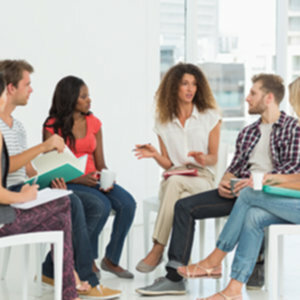 A family therapy program, with an educational series on the medical aspects of co-dependency and group and individual therapy, is an integral part of the WhiteSands Treatment Center rehabilitation process. A family approach to treatment is more effective than individual-based programs alone, and tends to have higher rates of success when combined with Cognitive Behavioral Therapy. If family members are available to travel to the treatment center, sessions can be carried out in person. In cases where the family cannot come to a session, our therapists can utilize Skype or conference calling to carry our therapy. Oftentimes an addiction will be accompanied by a form of mental health disorder; this is known as a dual diagnosis. These co-occurring disorders are often a combination of substance abuse and mental health issues such as anxiety disorders, depression, bipolar disorder, and schizophrenia. A dual diagnosis can occur in a variety of ways. Someone who suffers from a mental health disorder may attempt to self-medicate with alcohol or drugs. On the contrary, an addict may develop a mental health issue from feelings surrounding a severe and prolonged addiction. Due to the complexity of the illness, it is extremely important that someone who suffers from a dual diagnosis seek professional, medical assistance. Learn more about our Dual Diagnosis program here.